The session menu is a panel which appears during the life of your remote connection to give you access to a number of features and functionality ranging from printing, sharing disks, multi-media, screen capture, and more. It is designed to be consistent across operating systems whether you are using Mac, Windows or Linux or other platforms. To make the most of the functionality on offer, you should use version 4 or later on both the devices you are using (to connect from and to connect to). The rest of this Guide will explain what the icons in the screenshot below represent and how to interact with them: Input, Devices, Display, Audio, Mic in, Recording, Connection. For details on using the Whiteboard, file-transfer and seeing who's connected to your desktop, consult the Appendix dedicated to the Monitor. Once the remote session to your desktop is open and running, to access the Menu Panel, enter the key combination Ctrl+Alt+0 or move your cursor to the page-peel in the top right-hand corner of the window. The above panel lets you fine-tune keyboard input, mouse and pointer activity, as well as menu appearance to your own requirements. Grab the keyboard input - Checking it disables the capturing of some system key combinations, e.g., Alt-Tab, and allows you to use those shortcuts in the remote desktop, such as for switching between application windows. 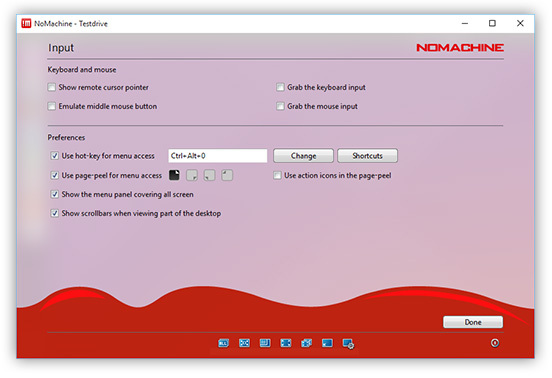 Grab the mouse input - Enable to stop the cursor from moving out of the NoMachine window. Show remote cursor pointer - Check to show the mouse cursor of the remote computer when connecting to another desktop which is not your own. Emulate right mouse button - Enable (users connecting from Mac) to use Ctrl + mouse click in place of right-button on mouse. Use hot-key for menu access - Check the box to use hot-key menu access and personalize the keys to be used. Set to Ctrl-Alt-0 by default. Use page-peel for menu access - Disable or enable 'Page-peel' and choose a corner that won't interfere with your browser or file commands (top right, bottom right, bottom left, or top left). Hovering over the corner to display a page curl effect will quickly pull up the Menu when clicked. Show the menu panel covering all screen - Choose how the menu should appear, covering all available window space or be an overlay. Show scrollbars when viewing part of the desktop - Enable or disable showing of scrollbars when partial area of desktop is showing. Check 'Use action icons in the page-peel' to show Fit to Window, Fullscreen and Minimize icons. The first time you want to use any of the following in your session: printers, disks, USB devices, network ports and smart card readers you must connect the device first, after which that device will always be available in your session until you 'Disconnect' it. Devices can be connected both ways i.e from the local machine to the remote computer and vice-versa. II By clicking on 'Connect a disk' icon. This section will deal with the second of these options. Choose this option if you want to make disk folders and their content available from local to remote or from remote to local. 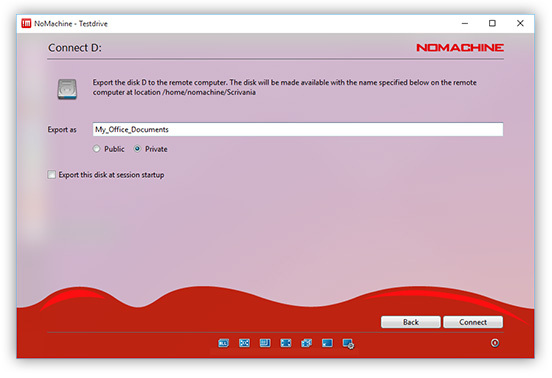 By connecting a local disk, you will be exporting the folder to the remote desktop. 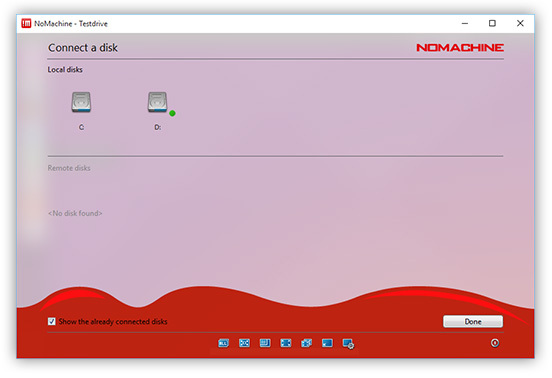 By connecting a remote disk, you will be importing to the local desktop. Provided the session is running, you will be able to copy files by dragging from the respective folder you just connected on to the desktop you are working on. E.g., if you just imported a remote folder to your local desktop, open the folder and drag the files outside the folder in order to copy them. For file-transfer between desktops, please consult section dedicated to The Monitor. The dialog will tell you the location for the folder that you want to share before you decide to connect it (Fig. 6). If you don't wish to select Connect, click 'Back' to go back to the previous panel. Upon closing the menu you will find this disk or folder in the location/path that was indicated in the dialog before clicking Connect e.g. /Users/nxtest01 (Fig. 6). Selecting to export or import as Private will mount the disk in different locations. Private is for a specific user, public will be visible by all users. On Windows, selecting Public will mount the disk in C:\Users\Public. Selecting Private will place it on the user's desktop. On Mac, selecting Public will mount the disk in /Volumes. Selecting Private will place it on the user's desktop. 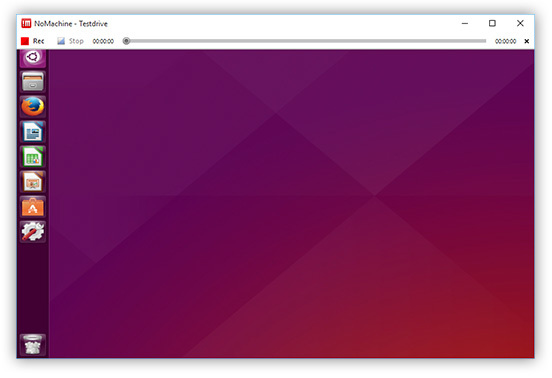 On Linux, selecting Public will mount the disk in /media. Selecting Private will place it on the user's desktop. To disconnect any disk, select the connected disk and click 'Disconnect'. Clicking 'Done' will take you back to the previous panel. 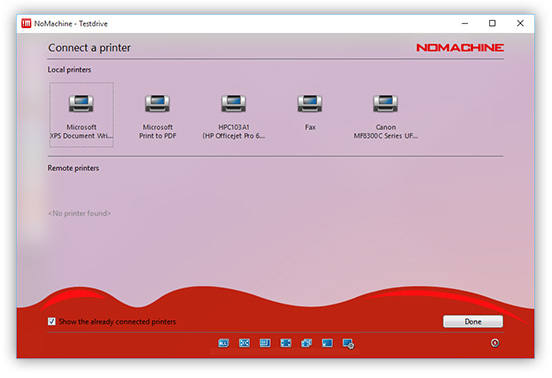 Provided you have a printer already configured on your local machine or remote host, you can choose to connect this printer to find it on the other side (local -> remote and vice-versa). Example: if you have an open document in the remote session, you will be able to print it on your local printer. Likewise, if you have a document open on your local desktop, you can send it to the remote printer for printing provided you have a connection open. To disconnect any port or service, select the connected service and click 'Disconnect'. Clicking 'Done' will take you back to the previous panel. E.g. Attaching an external drive from the local computer to the remote desktop. If you wish to access a drive which is already plugged in to your remote computer, follow steps 2, 3 and 4 for 'Remote devices'. Redirect any traffic you receive on local ports to the remote host and vice-versa. It's a way to tunnel traffic between two machines that would normally be seen as an external connection so that it looks like a local connection. For example, your organization may be using certain ports for other services, or the remote host may not permit access over a specific port. A predefined list of protocols used by the most popular network services such as CUPS, HTTP, FTP, SSH is available in the drop down list. You can also specify a custom port which will be forwarded and made available on the remote host just as if you were using it locally. By selecting a network service, NX will open an encrypted subnet circuit between the client computer and the server installed and will safely traverse firewalls that prohibit or filter certain services over specific ports. For example, an FTP server set up on a host may only be usable on the LAN at an organization and you therefore can't use it from outside the company network. Additionally, the fact that FTP is not encrypted can raise concerns. Connecting from an FTP client to the FTP server will be insecure or simply be blocked. 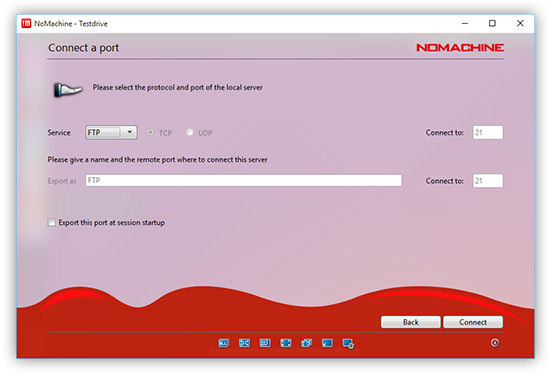 Via NoMachine's Network Ports, you can establish a connection to the remote server and forward the FTP port from there to the local computer. NoMachine will create an IP for the user (for example, Fig. 12) and display it in the GUI panel once connected. The user will be able to connect from their FTP local client using the IP and port, and all file transfers and other operations will be transmitted to the FTP server using a secure and encrypted NoMachine transport tunnel. Import or export a custom network port such as TCP or UDP. For example, to export a service from the local PC that uses UDP to communicate (e.g. 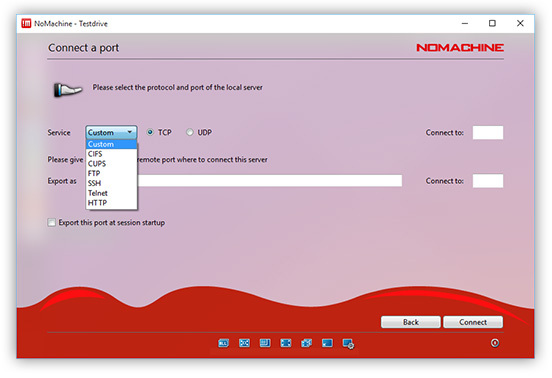 DNS, VoIP), choose the UDP option in the NoMachine GUI. The protocol selected must be consistent with the one required by the service specification. To disconnect any port or service, select the connected service and click 'Disconnect'. Clicking 'Back' will take you back to the previous panel. This service will make a smart card reader attached to the client (player) machine available on the server machine. Any application on the server that supports smart cards can be used just as if the reader was attached to the server machine. For example, a user can use the key stored on the card to authenticate to a server somewhere, or use it to digitally sign a document or e-mail. It is necessary to provide the path to NoMachine's libpkcs11.so library, where normally you would provide the path to your standard libopensc library. By default, NoMachine's smart card service uses the libpkcs11 library to handle the devices. If you wish to provide your own library to do this process, specify the path to the desired module in the 'Security module' field in the GUI. 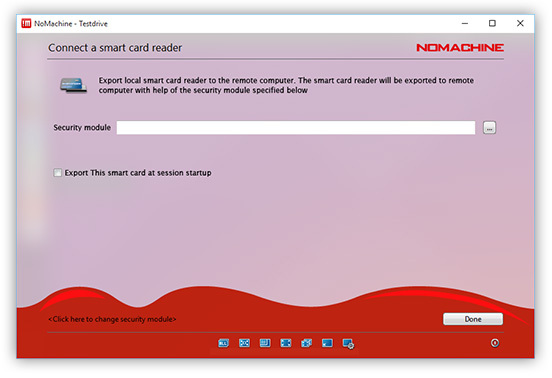 When you wish to use an application that supports smart card authentication or signing a document, the application (if not pre-configured for loading it) will ask the user to provide a path to the NoMachine module that operates the smart card. Change how you view the remote desktop, and adjust the performance to optimize the visual quality. 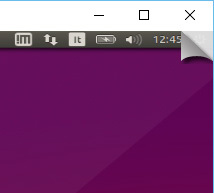 This icon appears when multi-displays are detected on the remote side (physical desktops only). Let users switch between applications which are running on different monitors. When connecting to the remote desktop, NoMachine detects that there are multi-monitors and will show the number accordingly. The keyboard short cut Ctrl-Alt-I is available to quickly identify which monitor is being viewed. Enable or disable showing the session content at the same size as the remote display (1:1). Disabled by default (no border activated around the icon), when the window size is smaller than the remote display, 'viewport' will be activated to allow you to move about within the window (pointing the cursor towards the edges of the window). When enabled (border activated around the icon), if the remote display is smaller than the client window, the desktop will be stretched to fit the window. If the remote display is bigger than the window, it will be shrunk to fit the window. To keep the aspect ratio and maintain the original proportions (width and height) of the remote display, keep pressed the Control button while resizing the window. Enable or disable resize of the remote window. Disabled by default. 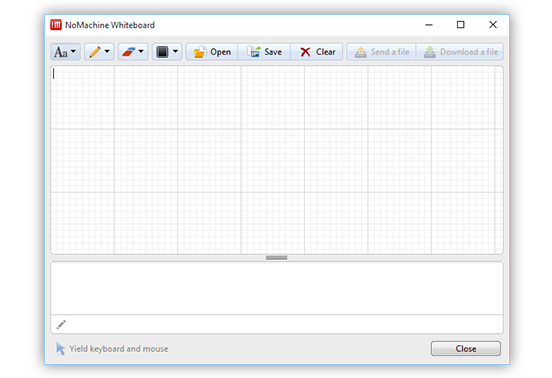 When enabled (border activated around the icon), changing the dimension of the session window will resize the desktop to always fit the dimension of the NoMachine window. Disabling will let you resize the window without scaling. Display your session on your monitor in full screen mode. Display your remote session full screen across multiple monitors. Minimize the session window, useful when the player window is in fullscreen. 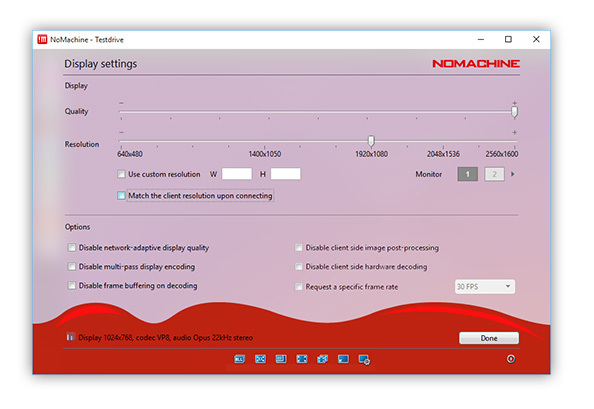 NoMachine performance has default settings which are suitable for most situations, but in some cases, such as in extreme network conditions or with particular applications, by adjusting the quality settings you can optimize your experience. The slider can be changed according to the quality of image that you prefer. By default it is set in the middle. By sliding it to the right, a higher quality of image is obtained (+), with more data being encoded and transmitted. This is best suited for network connections where bandwidth is available. On the other hand, if you want to consume less bandwidth, or your network conditions are poor, moving the slider to the left (-) will mean that data will be compressed as much as possible to save on the amount of bandwidth consumed without compromising on the speed at which data is being passed. 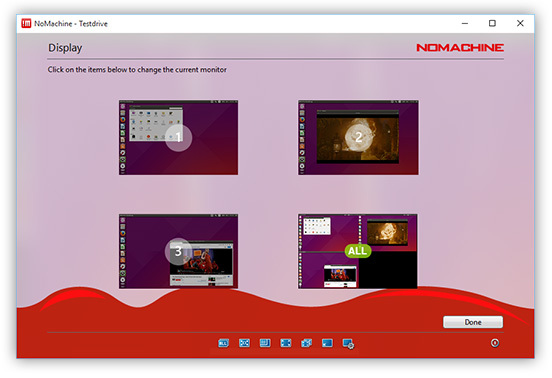 In most cases, although NoMachine will display the remote screen according to the preferences selected in points 5.2 and 5.3 the user might still prefer to resize the remote screen content to use the available space on the client screen. NoMachine will indicate on the slider the most standard resolution options, which are taken from the server side list of supported resolutions. Move the slider according to your preference. If any of the resolution options indicated don't suit your requirements, you can specify a custom width and height, and NoMachine will try to match it based on the server side hardware. (Note: Custom resolution is better suited for sessions connecting to virtual desktop sessions, rather than physical desktop sessions.) These settings are applied to the monitor highlighted in 'Monitor'. A further option 'Match the client resolution upon connecting' avoids having to set the resolution to mirror the client desktop dimensions every time the user connects to the remote desktop. Set resolution preferences per display. The number of monitors attached to the remote side is displayed when multi-monitors have been detected in physical desktop sessions. Disable network adaptive display quality - Checking the box will not disable the progressive refinement of the image, but will anchor the lowest quality to a fixed value, making it independent from the current network congestion. Not recommended when there is very limited bandwidth. The target quality will remain in any case the one specified in the Display quality slider. Disable frame buffering on decoding - Frame buffering is enabled by default and is triggered to optimize video playback when user is not interacting with desktop session. Disabling can be useful in order to see frame updates in real time. Not applicable to lightweight mode sessions (Linux). Disable client-side image post-processing - If the client-side device has low processing power, or too much CPU is being used to decode, disabling this can help. Disable client side hardware decoding - Client side hardware decoding is enabled by default. In rare cases, it might be necessary to disable to avoid video driver issues on Mac and Windows. Enable louder (more blue bars) or lower (fewer blue bars) audio volume. NoMachine automatically detects the audio settings on the remote host to work out-of-the-box. 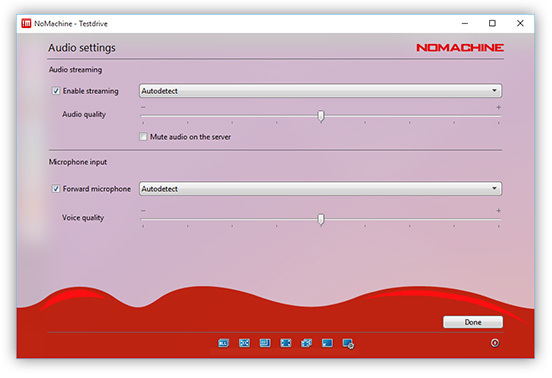 Audio is enabled by default and can be disabled by clicking on the left of the volume slider. Disabling audio will mean you don't hear sound in your session, sound will continue to be heard on the remote host if it is enabled. The slider can be moved to the right to improve audio quality or to the left to lower audio quality. By default it is in the middle which should satisfy most scenarios. By default client-side microphone is disabled. Enabling microphone allows you to forward the functionality of your local mic to the remote desktop so that you can use VoIP applications residing there. The slider can be moved to the right to improve voice input quality or to the left to lower quality. By default it is in the middle which should satisfy most scenarios. Enable louder (more blue bars) or quieter (fewer blue bars) microphone volume. Or completely mute the microphone by clicking the microphone icon at the top of bottom of the bars. Disabled by default. Connect a microphone by using the <Click here to connect a device>. Record the content of the remote window whether it's a video/audio stream, or any other activity within an application on the desktop. Useful for creating presentations, making how-tos, or even capturing an annoying bug. 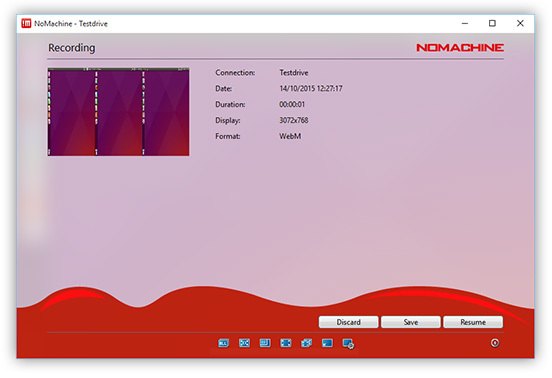 The clips are saved on the local device you are connecting from in the NoMachine folder and can be opened using any player with WebM support or the NoMachine player itself. Session recording allows you to perform basic operations including start record, stop record, pause recording, continue recording. Click on 'Show the recording bar' (Fig. 20) to open up the recording control bar. It will appear in the middle of the desktop, but you can reposition it as you wish. Click Rec to initiate recording, Pause to temporarily interrupt the recording, Pause to continue recording, and Stop to stop recording. You will be asked whether to save, discard or resume. Saving the clip, it will be placed in the local NoMachine folder. Use Ctrl-Alt-R to bring up the recording bar at any time. The recording bar can also be dragged to the top or bottom of the player window where it will merge with the border if this is your preference (Fig. 21ii). Hovering the cursor near the border will make the bar reappear. Click and drag it away from the top/bottom in order to return to the style of Fig. 21i. Clicking Stop in the recording bar will prompt NoMachine to ask you whether to discard, save or resume. Save a recording will save it to your local NoMachine folder. To start again without saving, select Discard. To continue with your recording, click Resume. Click 'Open a recording' (Fig. 20) to be able to select which recorded session you want to view using NoMachine's own player, and double click. Alternatively, you can browse to the NoMachine folder and open the clips using NoMachine's player or any other WebM-enabled player. Modify the recording settings to your own personal preferences. Save clips in an alternative folder, and alter the quality of video and audio of your recorded clips. Changing the quality of the video and audio here temporarily overrides the settings that you have in Display settings and Audio settings. Setting the slider to the far right allows you to record, for example, a video or game being played and maintain very high quality in the clip regardless of what the general settings are for the session as a whole. Setting the quality to low (left) will produce clips that occupy less space on your local disk. Higher quality clips (move slider to the right) will be larger. when two or more users are sharing the same desktop and all are recording but with different quality settings, NoMachine will choose the lowest quality among them. To identify when recording is taking place, check the 'blinking frame' box. 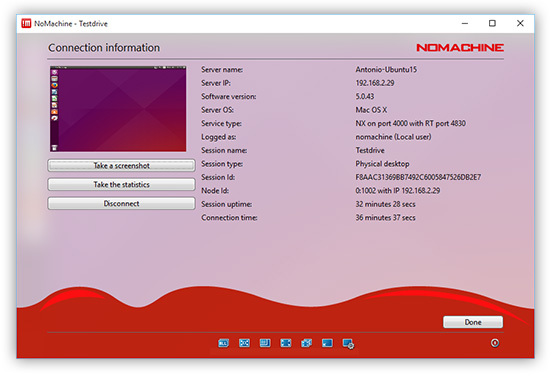 Find out basic information about your remote session, including NoMachine software product & versions, server name, IP address, user name, session name, how long the session has been connected, and more. This tool lets you take a screenshot of the remote desktop. Images are saved in the NoMachine folder. This tool lets you extract information about the amount of data being streamed whilst connected. It replaces the NX Session Administrator GUI in NX 3.5.0. You can 'Disconnect' from the remote session. User will be taken back to the connection menu. The Monitor is a resident service available in your system tray (!M icon) . 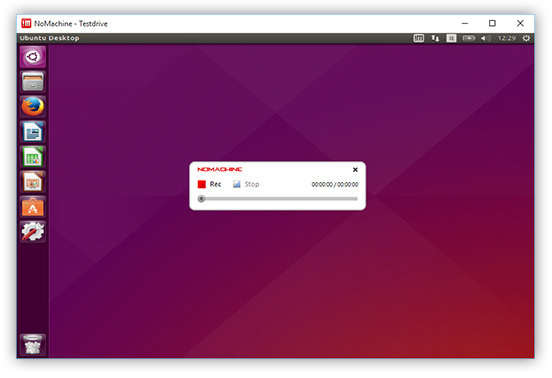 It lets you access some services outside the life of your connection, whilst others can be accessed only when you are connected to another remote (or virtual) desktop. 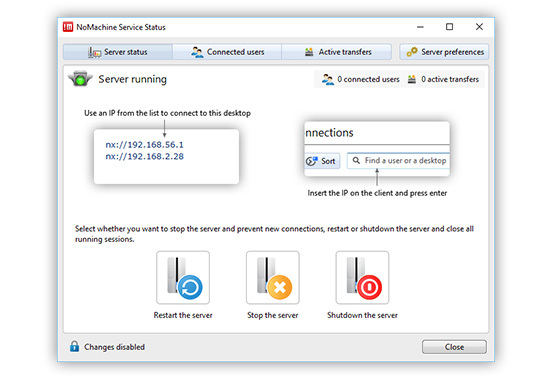 This section will deal with the Monitor services available on the remote desktop you are connected to for simplicity. 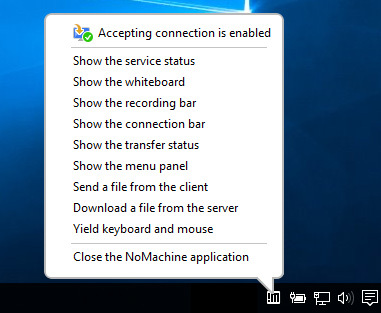 Click on 'Accepting connection is enabled' to disable access to the desktop. The !M icon will be greyed out and no further connections will be allowed. To accept connections again, click on 'Accepting connections is disabled'. To access the server settings, click 'Server preferences'. To modify settings in 'Server preferences' or start, stop and restart the server, you will be requested to provide the username and password of the administrative account on your machine. For more information about configuring services please consult the administrator's guide. Activate the local or remote whiteboard. Use it for instant messaging, drawing and sharing files with connected users. Fast-track access to file transfer. Enable the recording bar to start recording the desktop. If you access it from your local desktop, you will be able to record the local desktop. 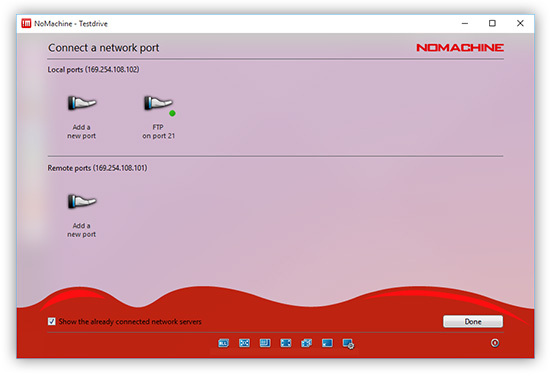 Show other NoMachine computers which are connected on your network. Show the status of files being transferred. Stop NoMachine server and services, you will be asked if NoMachine has to be run at the next startup. Enable the menu instead of using hot-key combinations or page-peel. Upload a file to the remote desktop to which you are connected. Transfer a file from the remote host (server) to your local desktop or device. Pass control of keyboard and mouse to a connected user.